We will visit the Pachacamac Monumental Archaeological Site, a sanctuary for the god Pachacamac. This site presents a sequence of human occupation, which started from 200 d. C. during the flowering of the Lima Culture. It was occupied by the the Wari (650 AD. ), and then between 1200 and 1450 A.D by the Ischma culture. When the Incas arrived in the Valley (1450-1532), they established new administrative centers, adapting the pre existing buildings to new needs: The Sun Temple, the Acllahuasi, Taurichumbi Palace, Plaza of the pilgrims, among others were built. 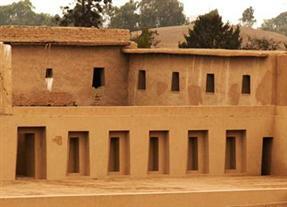 The Sanctuary of Pachacamac has great historical and cultural significance as a great ceremonial center. We will visit also the site museum where we can see the numerous artifacts recovered during excavations. In the main halls, we find samples of the main artistic expressions of the various occupants of Pachacamac, especially ceramics and textiles. Our visit also includes a visit to the traditional, eclectic and bohemian district of Barranco, continuing on El Salto del Fraile, and the Pantanos de Villa (Wetlands) and while enjoying spectacular views of the Pacific Ocean. 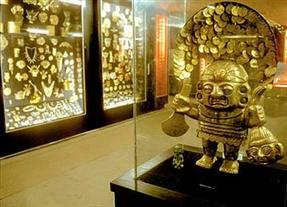 We will see the finest collection of gold and silver from ancient Peru. The Larco Museum showcases remarkable chronological galleries providing an excellent overview on 3000 years of development of the pre-Columbian peruvian history. Surrounded by beautiful gardens, it is located in a unique colonial residence of its kind, dating from the eighteenth century, which was in turn built on a pre-Columbian pyramid of the seventh century. The artworks of the Larco Museum are considered icons of pre-Columbian art worldwide. The collection of the Larco Museum has been seen by over 5 million people through exhibitions in the most prestigious showrooms, museums and cultural centers of the world. In the afternoon, we visit the most famous collection of gold Peru, in the Museo de Oro del Peru (Museum of the Gold of Peru), is a tour of a pre-Hispanic era where besides finding gold items, there are also many: textiles, feathers fabrics, vases, figurines and ceramics representing customs of the towns. As well as some of the mummified characters. The pieces display the craftsmanship of several centuries of Peruvian history, mainly in pre-Inca gold. There are decorative items of all the cultures, such as, embossed and weaved nose ornaments with cut stone pendants; sets of filigree figures depicting birds, men, or monkeys; mantles, bracelets and earflaps of the Vicus culture; lizards, weasels, felines, bags of coca leaves, earrings and belts of the Frias culture; pectorals with zoomorphic designs, flat or embossed crowns of the Chancay culture; funerary masks with twisted rays or serpents from Ica; and masks with open mouths and teeth, wristbands, shin protectors and spatulas of the Nazca culture, among others. We also find in the rooms of this museum weapons from 1,200 BC, Uniforms corresponding to various warriors and soldiers of times and places, horse saddles, armors and items that made history. It is certain that the visitor will find in the rooms a large sample, that can develop you an awareness of what was the ancient Peru and the rest of the world. 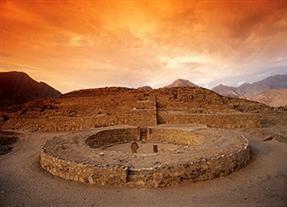 we visit the Sacred City of Caral, located in the middle sector of the Supe Valley. Its importance is that it is the most prominent urban settlement of its size and architectural complexity of all identified in Peru between 3000 and 2000 BC. Here more than 32 architectural ensembles of varying size and function, which, so far, have been identified 6 pyramidal buildings and a number of medium and small buildings, including temples, residential areas, public squares, amphitheatres, warehouses appreciated , coliseum circular tombs, altars and streets, which makes us conclude that albergo around about 3000 inhabitants. Among the most important buildings stands the Great Temple. The city of Caral had a complex sociopolitical organization, advanced level of knowledge in science, technology and art reflected in its architecture, being the oldest in America, and comparable only to other civilizations of the Old The world as Mesopotamia, India, China and Egypt. 03 nights accommodation in Lima with breakfast included.